Martin Murie answered the question. The late son of Olaus and Mardy Murie penned this piece only a few months before he died. 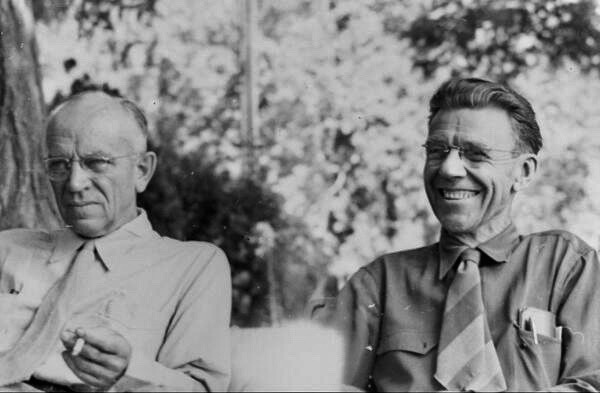 Forerunning American ecologist Aldo Leopold, author of A Sand County Almanac, joins his friend Olaus Murie in conversation about conservation. Murie was the Jackson Hole-based biologist who played a key role in helping to create Grand Teton National Park and getting The Wilderness Act passed in 1964. Olaus was the father of Martin Murie. EDITOR’S NOTE: Within the American conservation movement and the history of U.S. wildland protection, one of the most prominent families was the Muries who lived on a Wyoming ranch near Moose inside Grand Teton National Park. 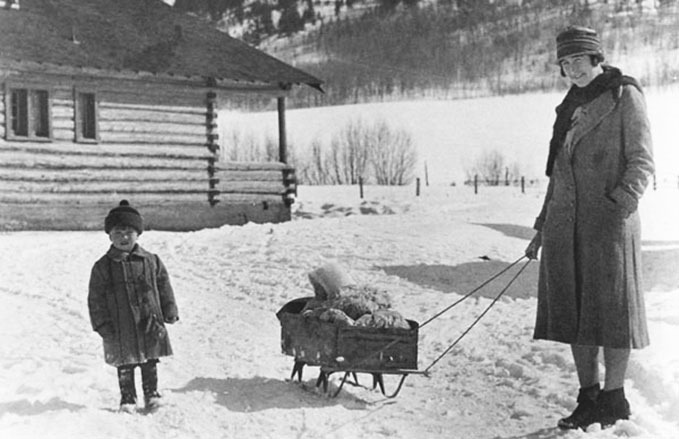 Between them, naturalist Margaret E. Murie and her elk biologist husband, Olaus, and botanist Louise Murie MacLeod and her ecologist husband, Adolph, were involved in a number of seminal conservation initiatives. They included advocating to protect a huge portion of Jackson Hole as a national park; criticizing the federal government's persecution of wolves, grizzlies and coyotes; helping to found The Wilderness Society, successfully lobbying for passage of the Wilderness Act in 1964, and rallying Congress to create the Arctic National Wildlife Refuge in Alaska. All of their actions had wildlife in mind. In recent years, some have invoked the Murie name claiming that those above would support reforming The Wilderness Act to allow mountain biking in wilderness and opening up other areas to expanded human recreation. Time and again, surviving members of the Murie clan have rejected those assertions. 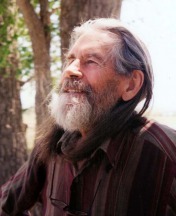 Below is an essay penned in the last months of his life by Mardy’s and Olaus’s son, Martin, for The Canyon Country Zephyr newspaper in Moab, Utah founded by Mountain Journal friend Jim Stiles (a close amigo of both Martin and the late Edward Abbey). Read Martin's bio at the bottom of his piece. One morning in a willow swamp I carried a camera close to a bull moose. I wanted a full-screen portrait. The moose, accustomed to trespassers, calmly went on browsing, his head low. Wanting him head-up, I made a sudden forward lunge. He tipped his antlers forward and came at me. I ran. From a safe place I looked back, saw that the moose had taken only a few steps to achieve his purpose. I gave myself an F. Bad manners, invasion of another creature’s personal space. A few years later I met a moose standing on the trail looking at me. On his left, the roaring waters of Cascade Creek in Jackson Hole, on his right a steep brushy slope. I took to the slope, intending a polite detour. The moose had the same idea. We raced for higher ground. The moose let me win. Encounters like these call for interpreting the minds of others. Of course it doesn’t always turn out in our favor. When a bull elk took the initiative and chased me I had only one option: scramble. 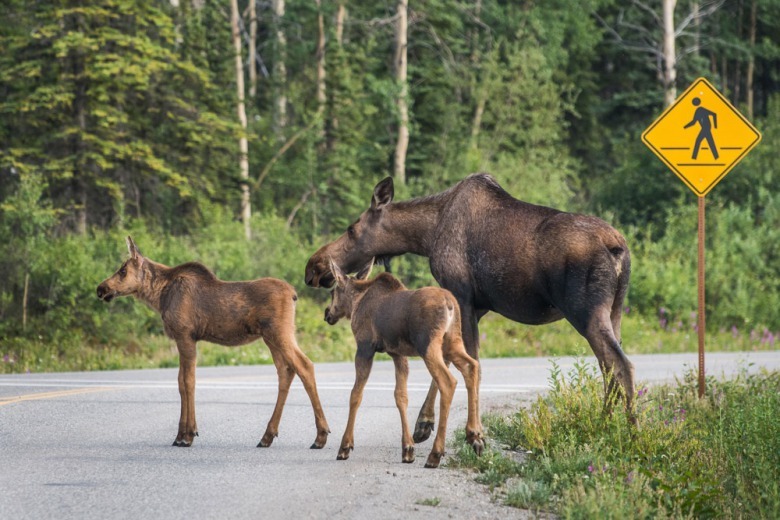 When too many of us came too close to a pair of black bear cubs, the mother gave us a lesson. Robert Krear, field biologist, tells of similar experiences. Concerning lions, both African and American, for example, he advises that steadily meeting the other’s gaze while raising your arms is a useful signal. The vast majority of creatures do not condescend to negotiation: mosquitoes, blackflies, ticks, leeches … the list is long, but we can be grateful for the buzz of the rattlesnake, the high-pitched cries and warning dives of falcons, the sudden synchronized body elevations of wasps, the hiss of the cornered badger. There are many signals out there, information that can make a difference. But what about machines in our lives? A huge subject, I’ll narrow my question: What negotiation space do foot travelers have when meeting that modern centaur, human-on-machine? Snowmobile, ATV, chopper, SUV, jet ski, power boat, mountain bike. What are the chances? Not good. 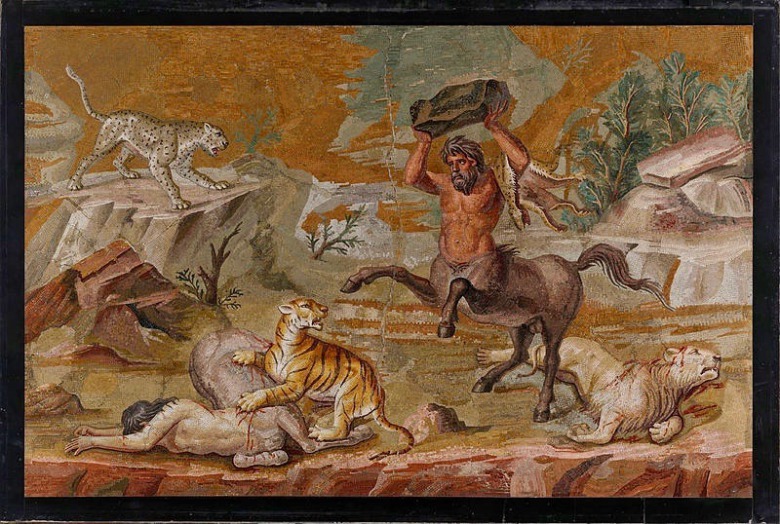 For one thing, with the exception of muscle-propelled bikes, centaurs don’t hear very well beyond the roar of their motors. For another, they often lack a sense of possible danger that is bound into the daily and nightly behavior of other forms of life. It’s important to know that wild animals are not single-minded lords of their realm; on the contrary their behaviors are complex and finely tuned: when to call, when to stand pat, when to run. That fine tuning is in us humans too, but in the last few thousand years of thinking lordly, ours has become badly blunted. Consider the range of apprehendings and behaviors of animals who fly under their own power or travel on four feet, or two, or two plus tail, or glide in water by limb, body and tail, or muscle their way underground with snout, shoulder and claws. We are of that lineage, that deep realism of bodies, of senses, created in our long and adaptive adventures as obscure components of earthly evolution. And you don’t need a meditation course to feel it. All you have to do is recognize it. This heritage is one of the reasons I feel violated when uninvited machines enter the scene. I feel trapped, literally. Rage rises, hate shows up. I’m not the only one. I can’t answer that last question. You appreciate nature in the ways possible when in centaur mode; you’re the ones to talk about it, if you want to do that. I hope you will. I’m not going to invade your personal space by pretending to know your innermost experiences. I do have to add that nearly all of us who choose to go off-track on two feet know something about centaur life; we’ve straddled bikes, driven vehicles, felt the speed and spray and joy of abandon, of power. And the limitations too, the way the machine demands constant attention, its needs insistent and primary. Our experiences do overlap with yours. Will that help, if we sit down for serious discussion? For the record, I don’t buy the elitist label. That, like cowboy myth rhetoric, is outworn and untruthful. It’s effective only in tearing up more ground between us. Skiers, though, that’s a difficult category. Are some of them still hiring choppers to save them a long alpine slog by lifting them to powder paradises? Now that’s elitist. Throughout his life, Martin Murie believed in the power of citizenship. Decorated in World War II for valor, and gaining a PhD in zoology, he inspired young and old until the end. 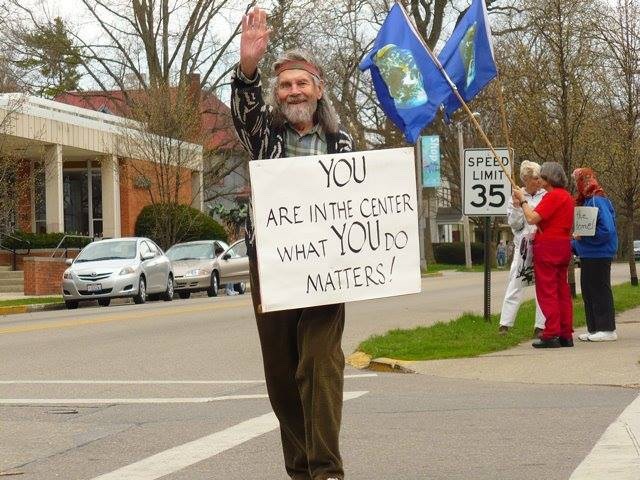 Here is Martin at an Earth Day rally. I’m not saying that we foot travelers are squeaky clean. Far from it. One of our behaviors that bothers me is the tendency to carry too much stuff. Do we really need to make ourselves into human mules? I’m thinking especially of kids in family groups or safaris led by scout masters or Outward Bound expeditions and the like who labor into wild country overloaded by gigantic packs on young shoulders. Where’s the fun in that? Does it develop individuality, confidence, expertise? Once I came upon a kid in one of those crocodiles who was literally wobbling from side to side, each step seeming to be his last, and the dad urging him on, and there was agony and hatred on the kid’s face. Hatred of the dad? Could be. "For me, the most aggravating trait of this intense, striving culture is its extreme self-absorption, individual life styles expertly manipulated by solid phalanxes of makers of ATVs and mountain bikes, equipment, clothing, adventure and all appurtenances thereto." Whether mechanized or not, we’re all implicated in, and captives of a gigantic RECREATION CULTURE where individuals are expected to reach their “own best” and then surpass it. For me, the most aggravating trait of this intense, striving culture is its extreme self-absorption, individual life styles expertly manipulated by solid phalanxes of makers of ATVs and mountain bikes, equipment, clothing, adventure and all appurtenances thereto. We endure countless scenes of environmental gung-ho on millions of screens, every day; tough vehicles driven by rugged trespassers crunching across rough terrain. Governments too are players. Consider the Forest Service’s proud slogan, “Land of Many Uses”. You can even pay to watch wild wolves hunt. The whole shebang, packaged so neatly, we fall for it. One, two, three, down we go. The basic idea seems to be that outside is a place where everybody has inalienable rights to do whatever the hell they take a notion to do, and recreation industries aided by governments are happy to accommodate all comers. If we accept such a premise we’re in for endless turf battles; drawing of complicated lines giving each and every “stakeholder” a piece of the action. Example: a ”consensus plan” in the Owyhee country (southwest Idaho, parts of Oregon and Nevada) threatens to shrink wilderness proposals to allow ATV access to wild country in order to avoid violation of the Wilderness Act. "The rationale [of collaboration and consensus] is that a shriveled wilderness bill that leaves out lands of true wilderness quality is better than no bill at all. If we give in to plans like that we can’t help asking if we aren’t selling the whole store." The rationale [of collaboration and consensus] is that a shriveled wilderness bill that leaves out lands of true wilderness quality is better than no bill at all. If we give in to plans like that we can’t help asking if we aren’t selling the whole store. I offer this description of actually existing wild country, whether authorized by Congress and signed by a president, or not: a place you enter at your own risk, where a mountain lion might be watching you, the weather might catch you. Take the cell phone if you must, but don’t leave behind your ancient and inborn all-purpose lifesaver: the ability to pay attention. EDITOR'S NOTES: 1. Read and support The Canyon Country Zephyr. 2. Jan Olaus Murie, son of Adolph and Louise "Weezy" Murie MacLeod, added this observation. it came in response to mountain bikers and other recreationists claiming that the Murie elders would support mountain biker efforts to weaken the Wilderness Act, strip away wilderness study area protections and open up wild backcountry to rapidly expanded recreation uses without regard to impacts on wildlife. Murie is professor emeritus in the Department of Biological Sciences at the University of Alberta in Edmonton. "I have noted stories in the Jackson Hole newspaper about mountain bikers and other 'recreationists' campaigning for loosening restrictions on them in some designated areas near Jackson Hole. I'm sure that the deceased Muries, Olaus and Mardy, Ade and Louise, would be absolutely against giving free rein to any of those groups, including mountain bikers. I don't think mountain bikes and those using them largely for thrills or achievement of some sort rather than simply a means of transportation were on anyone's radar in their activist days so I doubt that they would have written anything bearing directly on the current issue of their use of wilderness areas. No doubt there are writings that would suggest their opposition but I can't think of anything particularly apt offhand. I don't know a lot about the mountain biking fraternity--no doubt there are some who are sensitive to the real values of wilderness touched as lightly as possible by the hand/presence of people. But it seems that many look upon wilderness trails as they would a BMX course, a challenge to their bicycle riding ability and a source of thrills. The elder Muries always stressed the connection that we can have with nature in wilderness areas, something scarcely likely for those seeking adrenalin rushes. I think Martin well-expressed the thinking of Olaus and Adolph in the piece that was republished in Mountain Journal. Martin was always good at reflecting their conservation ethic. Anyway, there is no doubt in my mind that they would not look favorably on loosening restrictions on wheeled vehicles in wilderness areas or other designated 'wild' areas. It is indeed irksome when people with little knowledge of their views present (mis)interpretations." Martin Murie, a son of Olaus and Margaret Murie, and nephew of Adolph and Louise Murie, grew up in Jackson Hole with his sister Joanne and brother, Don. He served in World War II with the Army's legendary 10th Mountain Division—a special combat unit known for skiing. During his service, he lost an eye and was awarded a Purple Heart and Silver Star. He received degrees from Reed College and a PhD in zoology from the University of California-Berkeley. Later, he was a college professor, anti-war protestor during the Vietnam era and advocate for student rights and affordable education. He also was a talented, fiery writer. With wife, Alison, he was the father of three daughters. Martin died in 2012.